Create melodies with different included instruments and drums or add your own instruments and drums in Wav format to the internal storage. 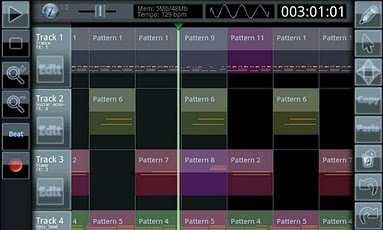 8-octave keyboard with detailed editing. 16 tracks for patterns to be added to. 16 channel mixer with 4 available effect per channel. Adjustable tempo from 72 to 162 bpm. Recording from phone to Wave format to add it straight to the tracks. Remember to check for new updates regularly. 48 MB of Heap Memory or more is recommended. New instruments and drums will be available for free download from now on.